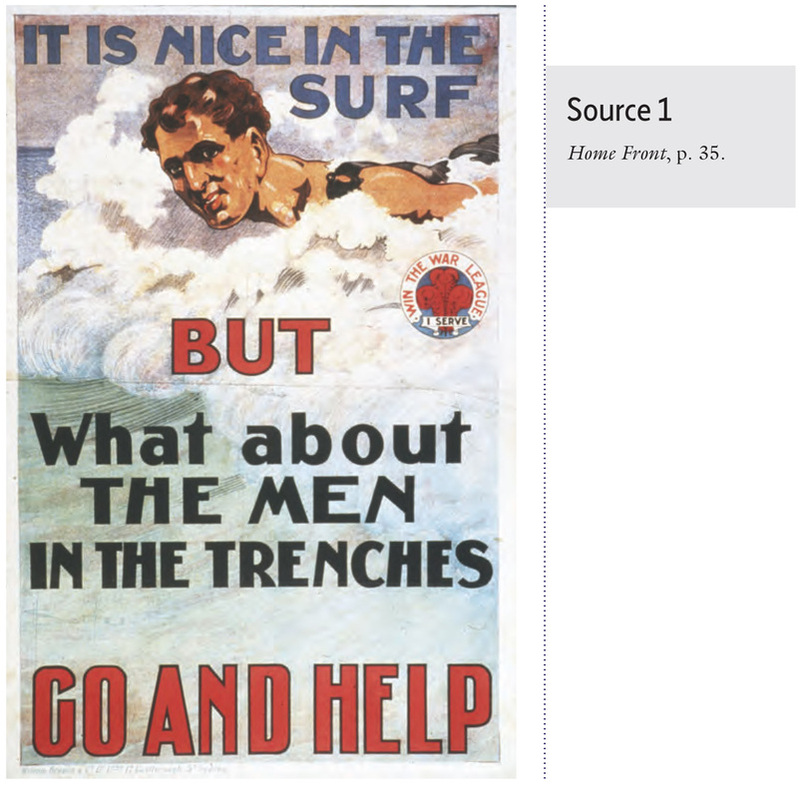 World War I had a significant impact on Australia. The nation was only 13 years old when it was drawn into this conflict, which is still seen as one of the most important events in the history of the world. As a result of World War I, Australia lost over 60 000 young men. Many of these men were the fittest and most able of the male population. As a percentage of total troops sent to war, Australia’s losses were the highest of any of the Commonwealth nations. The initial enthusiasm with which most Australians greeted the outbreak of war did not last. By the middle of 1915, the reality of war began to dawn. Following the landing at Gallipoli, Australians received the news of more than 2000 deaths. As a result, many in the nation took a more sober view or became disillusioned. There was still strong support for the war and the soldiers, but any excitement had evaporated. By late 1916, Australia was a bitterly divided country. Not only was there a growing dissatisfaction with the war, but a real sense that there was ‘inequality of sacrifice’. 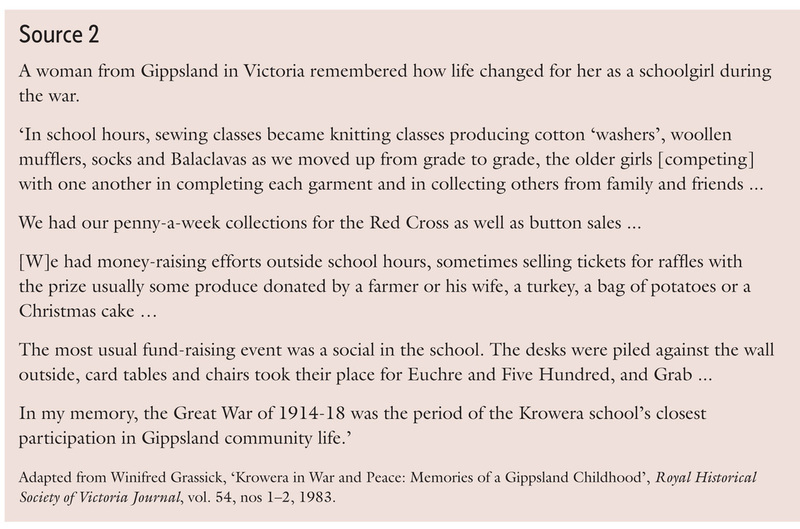 Many working-class Australians felt that they had contributed the most in terms of enlisting soldiers, and that they were also being exploited at home. There was a perception that middle- and upper-class people were less affected by the war. Some were even seen to be profiting from lucrative government war contracts. These perceptions were not always accurate, but they still had an impact on the growing divisions in the nation. There was also division between those who had gone to war and those who had not. Much of this bitterness came to a head with the conscription debate in 1916 and 1917. 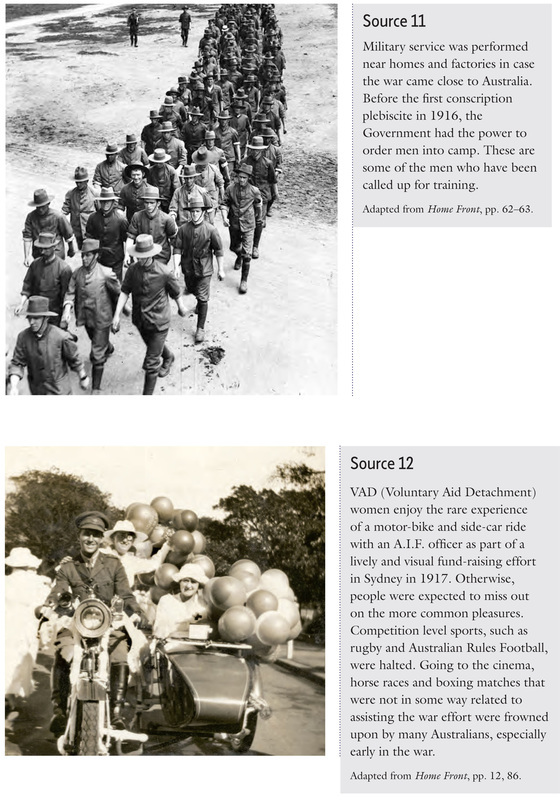 What do you understand by the terms, ‘home front’ ‘Voluntary Aid Detachment’ and ‘war loan’ ? Define these in your own words. What did some Australians ‘go without’ on the home front? What did others ‘gain’ from the experience? Looking at the following twelve sources from Home Front complete the table below. 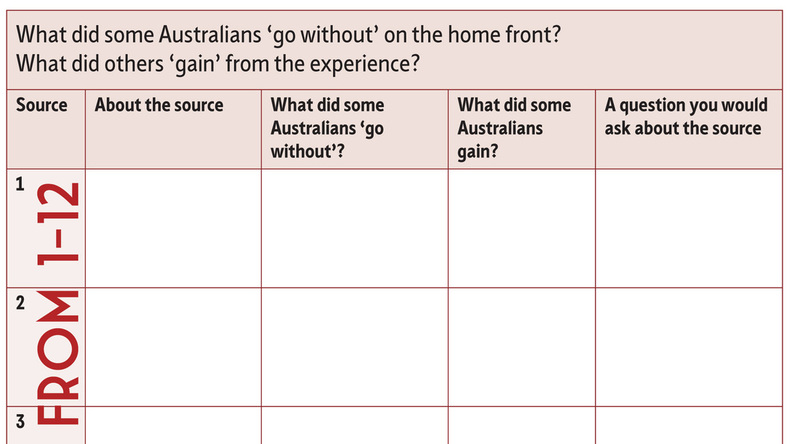 When completing this task think about the values that shaped what people believed and what they did. Consider who the different individuals and groups most had in mind when making their decisions.